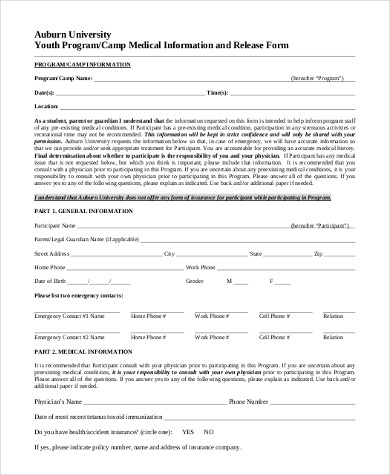 Medical Release Forms are readily available for download here. 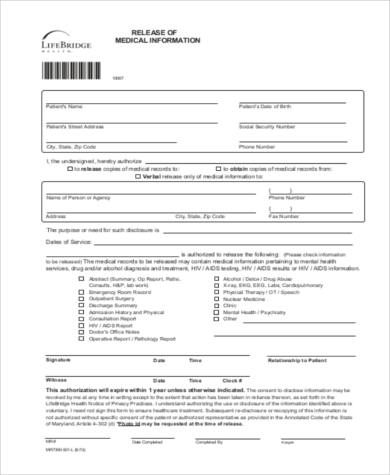 These act as an authorization if you need to know about or obtain a patient’s medical activities inside a hospital or any medical facility. 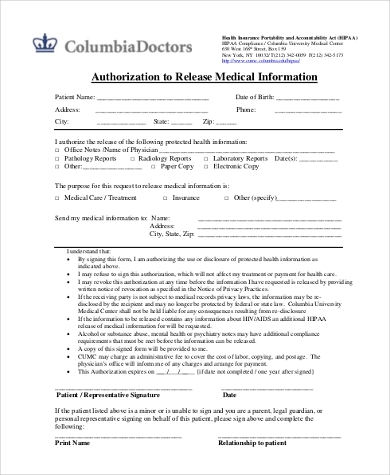 Not just anyone ask for these records, though if an approval from the patient or the patient’s guardian is formalized, then those records will be opened – but they will be released within the infirmary only and will be used as a reference and nothing more. Although the records are officially “released,” this does not mean these are for the whole public to enjoy. 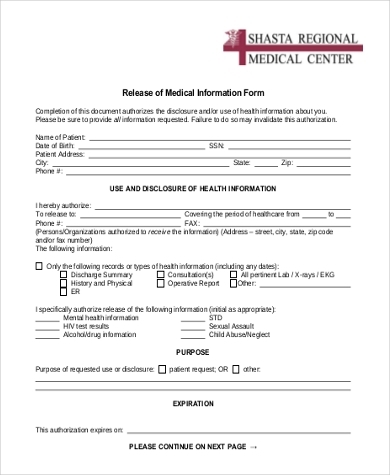 Like Medical Release Forms, Medical Records Release Forms are also available here. Both are related, but the latter also acts as an endorsement if you need to know more about or acquire a patient’s medical records, which are not supplied freely. Under the Hippocratic Oath, doctors are obligated to respect the privacy of their patients, though if any approval coming from the patient is confirmed, then that will be the time for the records to be released. Again, even if the records are termed “released,” this does not mean these are for the whole public to view. 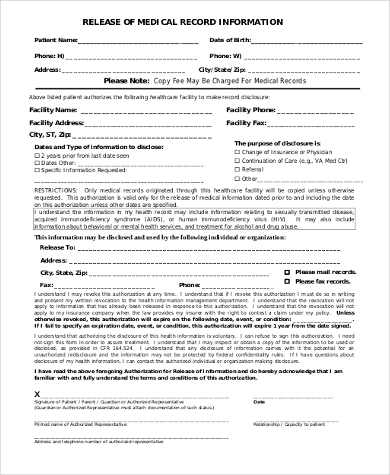 Medical Consent Forms, on the other hand, are the kind of forms for patients who cannot legally yet decide on their own; a child, for instance. 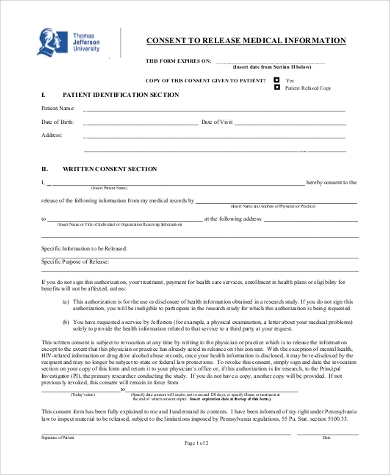 The medical personnel cannot administer anything to or treat a patient except under the circumstances where the former has the patient’s consent. Not only it is a courtesy; it is also in accordance with the law. If you need to ask for any information, especially those medical-related, Release of Information Forms are needed. It is not that easy, however, since these need to have a consent from the patient, and expect to have a little difficulty with the patients themselves. 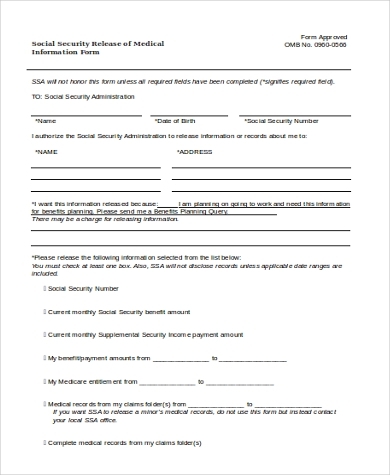 The said forms would help you with what specifics can be disclosed and to whom, as well as the reason for opening such information. We have made sure every form you might need is easily understood and cover a wide range of scenarios for when you need information disclosed. Our forms cover the reasons for such disclosure and basically everything you need to know of the release. 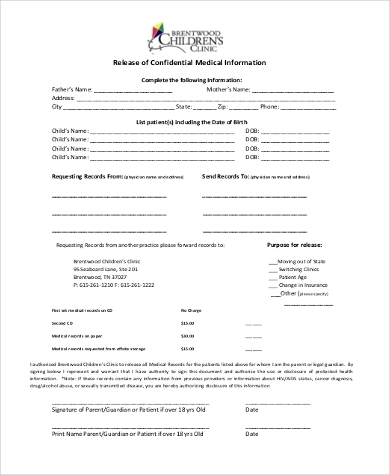 All you have to do is to print out the form that you need and then fill it out. I guarantee you the forms available here have been gone over by professional staff.